Chewy red hots cinnamon hearts are the perfect Valentine candy. The same great flavor as red hots candy just a chewy version in the shape of tiny hearts. Spice up your Valentine's day with our red hots chewy hearts. One of the best things about this little hearts is they are not super hot, start chewing them and get a blast of cinnamon flavor that lasts the whole time you are eating the candy. Red hots are a very popular candy for Valentine's day, now you can buy them in the shape of hearts making them perfect a perfect Valentine Candy. You won't go wrong when buying these for your special hot someone , however they are also great for using to decorate your Valentine sweets. Don't forget we also have Cinnamon imperial hearts as well. 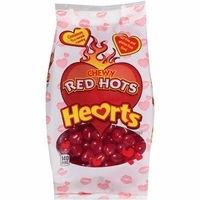 Chewy red hots hearts are a gluten and fat free candy, they come in a 11 oz bag. Each bag as about 230 cinnamon hearts.